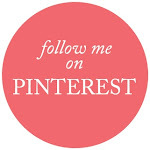 Time for a new Fashionista Friday challenge from "The Shoe"! This week we are having a birthstone challenge for the month of February. 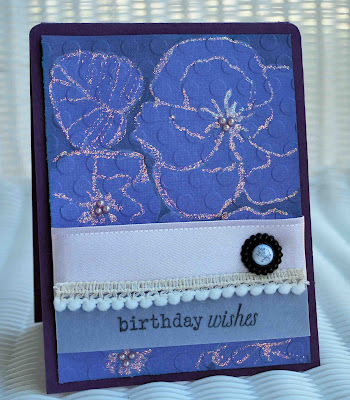 Make a card and use the color purple. This worked out wonderful since that's my birthstone, so fun that I share a birthday month with "The Shoe". I used Papertrey Ink "Year of Flower - Violets" and stamped my background. I then traced the flowers with a grey Copic to add dimensions. 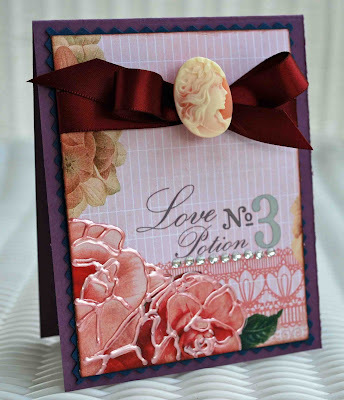 I embossed my stamping and glittered the flowers with Stickles. I stamped my sentiment on vellum, added ribbon from Really Reasonable Ribbon and a Vintage Brad plus Pink Pearls from Creative Charms. 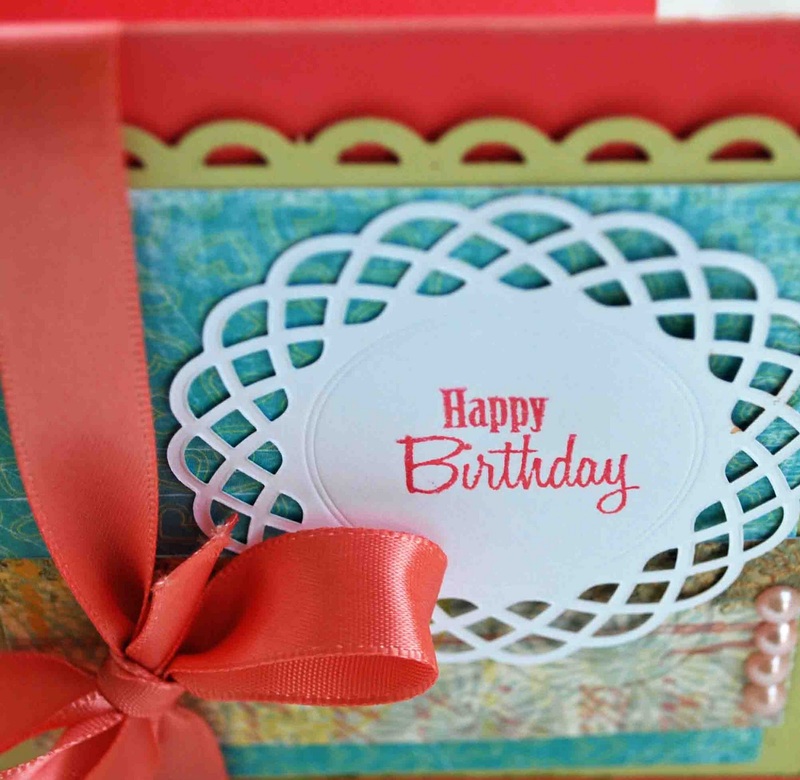 My cardstock is Papertrey Ink and Core'dinations. Visit "If The Shoe Fits...Scrap It!" to see the Design Teams darling creations! Hi all! Two posts in 1 day, amazing! 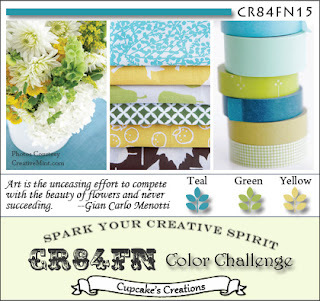 I've got a little card to share tonite that I made for the CR84FN Color Challenge and Moxie Fab World - Get Daring with Decorative Tape Challenge. I've had some Pink Paislee decorative tape in a drawer for months and not done a thing with it. So I decided to make my own patterned paper. 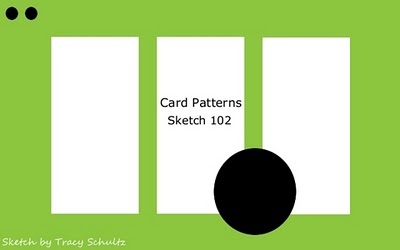 I started out with green cardstock and criss crossed my tape, making my own plaid pattern. I then ran it thru my Cuttlebug and embossed it, then inked the embossing with green ink. 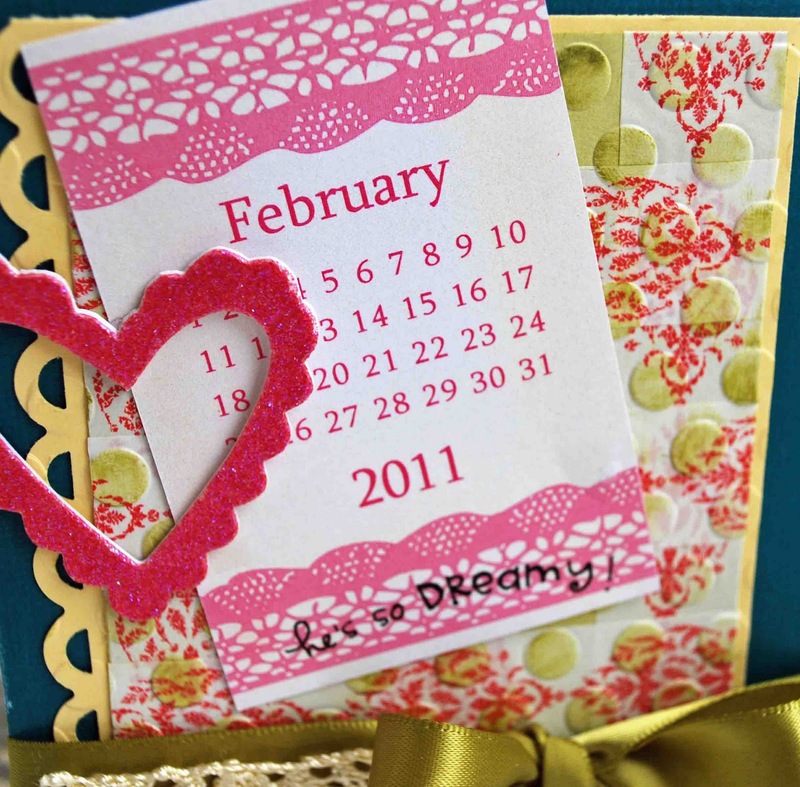 I must have a little Valentine's Day "love" left in my system, because I added a February calendar, heart, and "he's so dreamy" rub-on. Love the sentiment! OK so I've went a little overboard on challenges today. But it was a pretty day and the house was clean, plus I didn't have to work. So I had some extra time on my hands. Sometimes it is so fun to go out of your comfort zone and create something. I think shimmer sprays are messy and I try my best to avoid messes, but Moxie Fab World has a shimmer challenge this week that I wanted to enter. So I used Papertrey Ink's "Year of Flowers - Violets" as my base. I stamped them onto white cardstock then used Tattered Angels Glimmer Mist and Shimmers Spritz to color. I used a q-tip and stuck it directly into the shimmer bottle to soak up. Then I dabbed off the excess and started coloring my image. It's kinda like using water colors, you can make areas darker or lighter by adding more mist. Then I cut my stamped image out and the great thing is since glimmer mists are water, the leaves and flowers slightly curled around the edges, adding a very pretty touch. I then added a vellum sentiment as the finishing touch. Enjoy!!! If The Shoe Fits....Scrap It! Hi all! Hope you're having a terrific week. It's been sunny and in the 60's and 70's here the past 2 days, so I'm in Heaven! I have a really bad case of Spring Fever. I wanted to keep my card simple. I love the "Berry Sorbet" colors from Papertrey Ink, so I used those colors for my cardstock, ribbon, and ink. I added pearls from Creative Charms and Pink Paislee and MME patterned papers. Visit If The Shoe Fits...Scrap It! 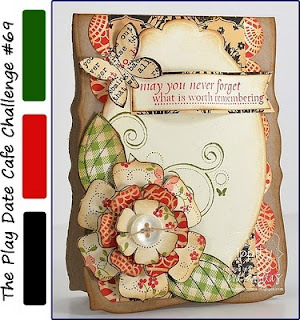 to see the "Shoes" beautiful takes on this week's challenge. CC will mail you a gift in return. The only requirement is you have to “Like” Creative Charms on Facebook. Everyone wins! Hi everyone! Made a shabby little card on this lazy Sunday. First up is CardPatterns Sketch 102. 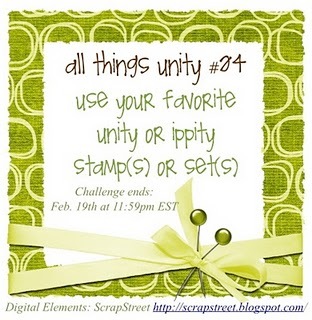 I'm sure everyone has a favorite Unity or Ippity Stamp! My favorite comes from the "Life is Fabulous" set from February 2010. 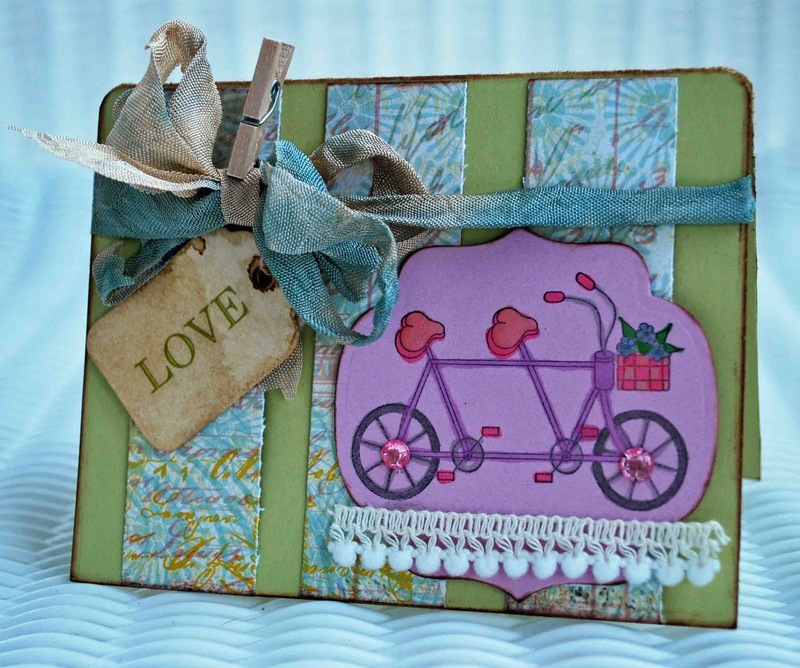 I love this "bicycle built for two"! 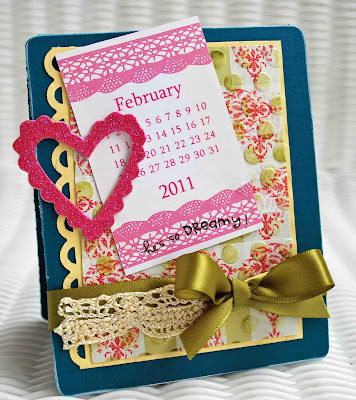 I used pretty Pink Paislee patterned paper, Papertrey Ink Cardstock, and wrinkled ribbon from Etsy. I used a vintage tag and inked everything in brown to make it look rustic. 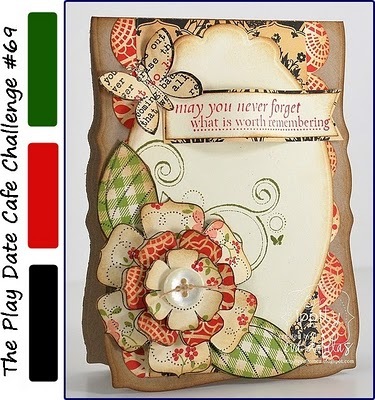 I also made this card for the Wee Memories Challenge 43 - Live, Laugh, Love. And don't forget the sweet Valentine's Day Giveaway at Creative Charms Facebook page. 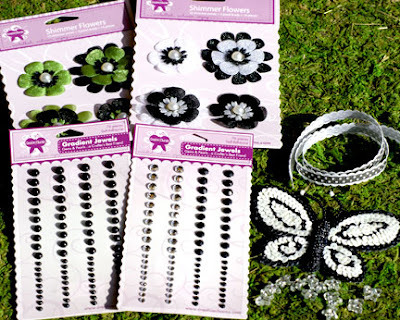 On Monday CC will be giving away a Deal of the Month kit to TWO of our fans on Facebook. All you have to do is "like" the CC Facebook page for a chance to win. I also received a little Design Team news today. Will give you all the fun details later this week! 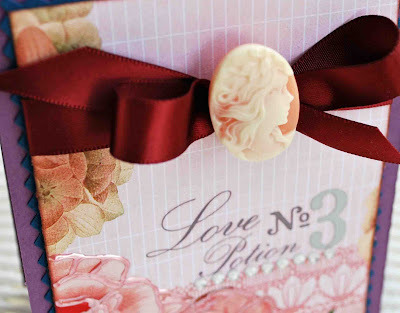 I'm a bit obsessed with PTI, they're stamps are soooo very adorable, love their cardstock, ribbon, buttons, the list goes on and on. Another thing I love about PTI is that the designers give such great tips and inspiration, things I can use when creating. I'd never made a card using one sentiment theme and repeating that for my title. It's a really fun technique that I'll use again and again. The "Friendship Jar" Stamps is one of my favorite sets. So I thought "why not fill a jar with a little love." I filled the jar with sentiments that center around the theme "love". Very sweet Valentine! I also want to send a big "thanks" to the girls at The Play Date Cafe. 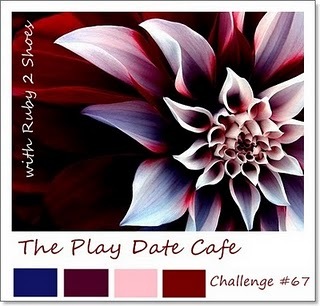 I won the Cup of the Week for their Play Date Cafe Challenge 67, woot woot! OK, so I'm behind a few months. Finally got my Fall pictures developed, thank you SnapFish! Love the quality of my pictures and the colors. So I have a few LO's to share tonite. This is Thanksgiving at my Papaw's. 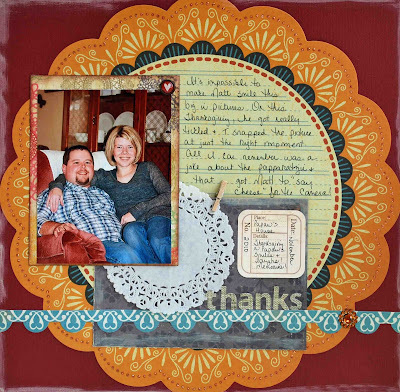 I used Noel Mignon's "Dear Diary" Kit on both LO's. Autumn is probably my least favorite time of the year, because Winter is next! But I love working with the darling Autumn colors! Got a few pictures to share tonite. 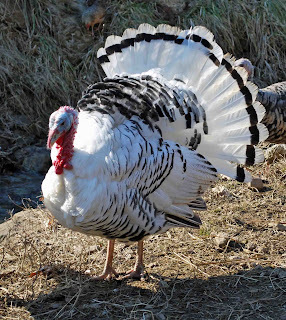 Since I'm already talking about Thanksgiving, lets talk turkeys. Remember my turkeys I hatched in an incubator in July. Well my 3 Tom's (male turkeys) are all grown up and struttin' their stuff. They are constantly strutting and gobbling. When you get near the barnyard they start gobbling, I'm sure they're saying "about time, we're ready for a snack." These guys are great pets and we love them. Speaking of pets, my local newspaper is having a "Cutest Pet" contest. I know I have A LOT of pets, so how do I pick one. Since we have to submit a picture, I decided to pick the pet that is in one of my all time favorite pictures, and the winner is Freddy the Donkey! He loves treats. That's what he's after in this picture and I love his little pearly whites! Looks like dentures! So if you have time, I'd love your vote. 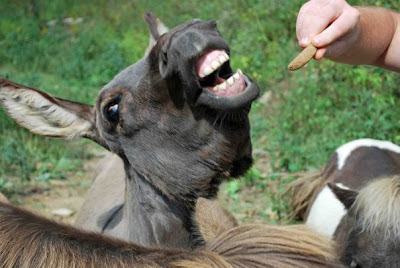 Just follow this link to vote for "Freddy the Miniature Donkey". Voting is from February 7th to February 23rd. I wanted to make this card as "girly" as possible. 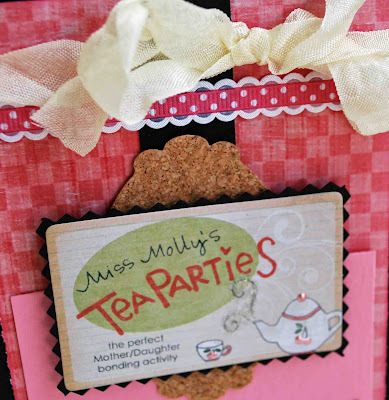 And with the help of Melissa Francas and Kitsy Kitchen and Creative Charms I achieved what I was looking for! 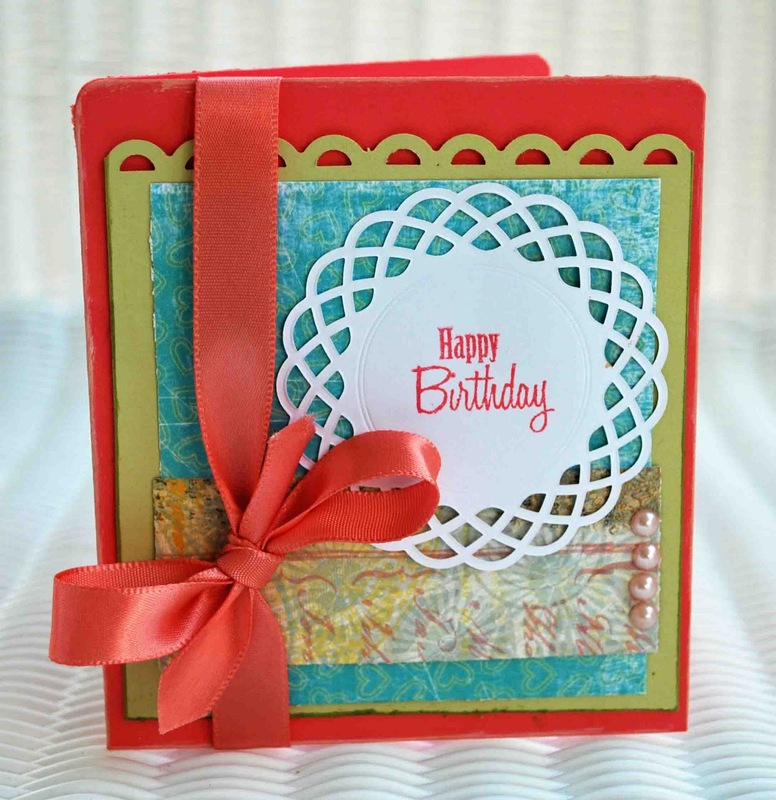 I also entered this card in this week's CardPatterns Sketch 100. Enjoy!!! I'll be honest, when I saw these colors I thought "how in the world will I use them in a card???" I think that's why it's called a "challenge". 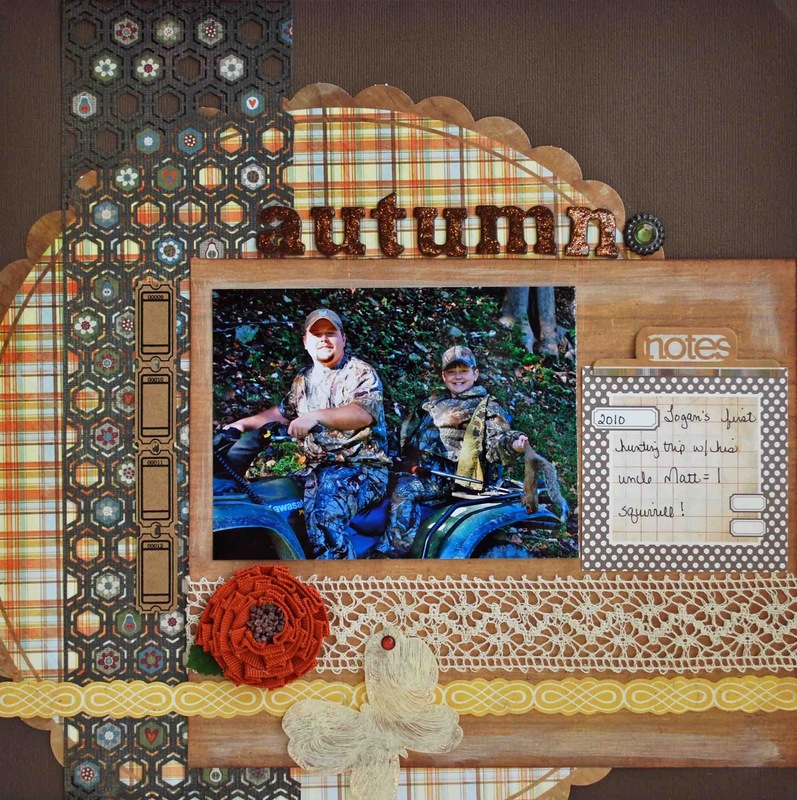 It's neat to keep your style of crafting, but push yourself by adding elements you usually wouldn't. Lots of pink, with a little red, blue, and purple. This adorable paper and rub on are from Pink Paislee. 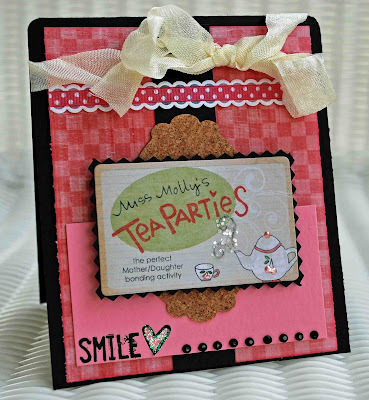 I used some pink liquid pearl, gems from Creative Charms, a Jenni Bowlin cameo, and ribbon from Papertrey Ink. And a little Creative Charms news, the Deal Of The Month and Kit Of The Month are now available at the Creative Charms Store. The February Kit Of The Month is titled "Simply The Best". 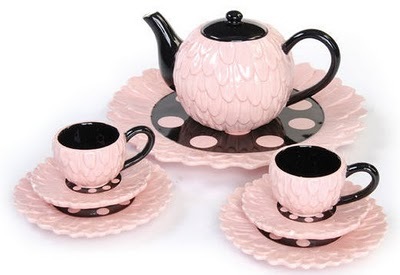 It is a 62 piece kit available for $14.99. 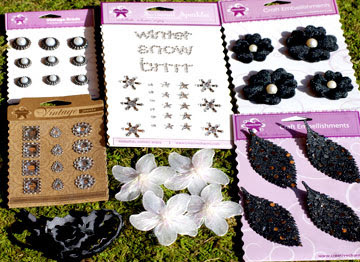 The February Deal Of The Month is called "Simply More" and contains 194 pieces of embellishment goodies for $6.99.